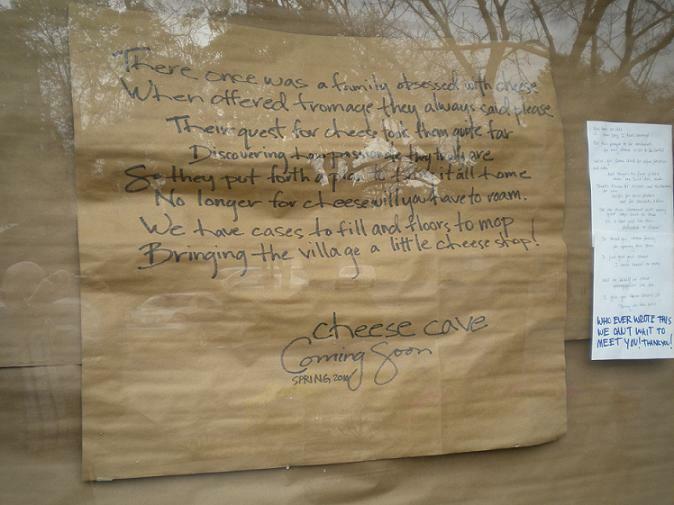 In the Claremont Village, the former All Ways Travel storefront (Yale between Bonita and Fourth) is being converted into the Cheese Cave, a frommage-centric shop. While the space is being renovated, butcher block paper covers the windows. 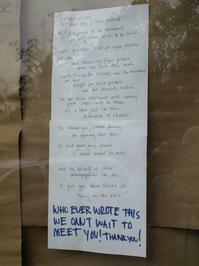 But those windows have also become the best site for poetry outside the Folk Music Center down the street. First the owners put up a self-penned poem about their venture, above. Then, it appears, a would-be customer responded with a second poem, which is now displayed alongside the first, at right. This entry was posted in Around Claremont by David Allen. Bookmark the permalink. 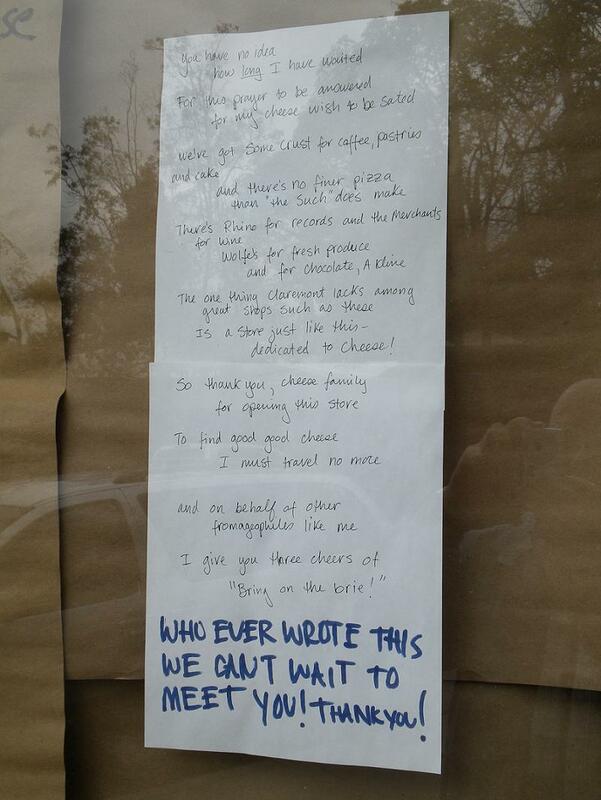 Not to quibble with the cheese poem, but Claremont also lacks a bookstore, right? Oh, yes! I’ve been to two of those four… Rhino and the Thoreau Bookshop. But still, a nice used/new bookstore, right there in the village… c’mon, Claremont! To Claremont’s credit, there used to be two bookstores in the village… a store on a little side street that’s been gone for about ten years, I think, and that used book store on the second floor above the shoe repair place that I was always too intimidated to go into. I think you blogged/columned about the latter when it finally closed. Maybe even in a town with a couple of dozen colleges, book stores just can’t make it in this day and age. What more must the Thoreau Bookstore do to qualify as a “serious” or “nice” used book store? To me it is both of these and more. Paperbacks are $2 and hardcovers are $4. I always come out with at least 2 books every time I visit. The other day I found a book I have been looking for for about 5 years. Two Saturdays ago, they had an all-day sale where almost every book in the store was just $1. They even have a book booth set up at the Sunday Farmers Market on Second Avenue in downtown Claremont. For those who don’t know, it is located in the Packing House on First Street, west of Indian Hill, behind the wine bar. P.S. In addition, the proceeds go to a good cause. So now I wonder, whats in store? Free verse about the days of yore? A sonnet on the MetroLink? Haiku on where you eat & drink? Even Huntley Bookstore has its problems. So many students either read and/or buy their academic books on The Internet that many books for my husband’s classes are not sold at Huntley. Alas, the state of independent and chain bookstores is seriously threatened. As a lover of “out of print” books, I must admit I like searching on my computer rather than combing the streets. Seriously, this poetry throw-down is another “only in Claremont” moment. Every time I read about crime or some other modern intrusion on Claremont and think how much it’s changed since I lived there in the ’50s and ’60s, something like this comes along to reassure me much is still the same. I used to work in and manage a cheese shop called The Cheese Shop and have been waiting with cheese baited breath forever for someone to be smart enough to open up a cheese shop with real cheese. Thanks to Donna for doing this!!! I can’t wait! Maybe she will give me a job? You might enjoy Tasting to Eternity. The book can be reviewed on the website. The history of bookstores in Claremont has always been dicey. In the late 50s and early 60s, there were two bookstores in Claremont I recall. One next to Barrett’s drugstore, full of Evergreen publications and lots of poetry books. A new paperback book store opened in the Safeway Mall by Oakmont elementary school — featuring new publications and classics at fifty cents! That store sadly was gone before the shopping center went away. Maybe there was a spin rack taking up vertical space in the other two drug stores, with best selling paperbacks and westerns and obviously serviced by a company that preselected the books for sale, which seemed out of step with the community at large, so the racks were eventually removed. That was it for years aside from the one student bookstore on campus. Then during that time the old man who owned the small book store next to Barrett’s was talking about retiring. Someone jumped in to fill the void and opened a mercantile on Bonita and Yale in a small cottagelike building on the corner, which had previously housed an expensive gifte shoppe of copper kettles and such … repurposing the scenic flower cart with large white wooden wheels that was included with the fixtures, shelves, and counters to hold books on sale. That person likely had not ever read a book it seemed and just decided to open what at first glance promised to be a profitable business — a bookstore in a college town. Couldn’t make money and was out of business within a few years. We used to joke no one needed books in Claremont because they’d already read everything.